We got this really cool animalito when we were in Mexico!! He is an alebrije, which is basically a whimsical monsterlike animal. He’s almost a foot tall and is made of paper mache. I was originally drawn to him thinking that he would be a great example for a paper mache project to do with my students some time in the future. I got lots of stares throughout the various airports as he was my carry-on all the way back to Honduras. Posted in Art, MexicoBookmark the permalink. Must say I’m rather envious of all your wonderful Latin American artwork that you’ve collected. Cept you need a museum to hold it all, especially after two more years in Ecuador. Cant’ wait to see it all together. 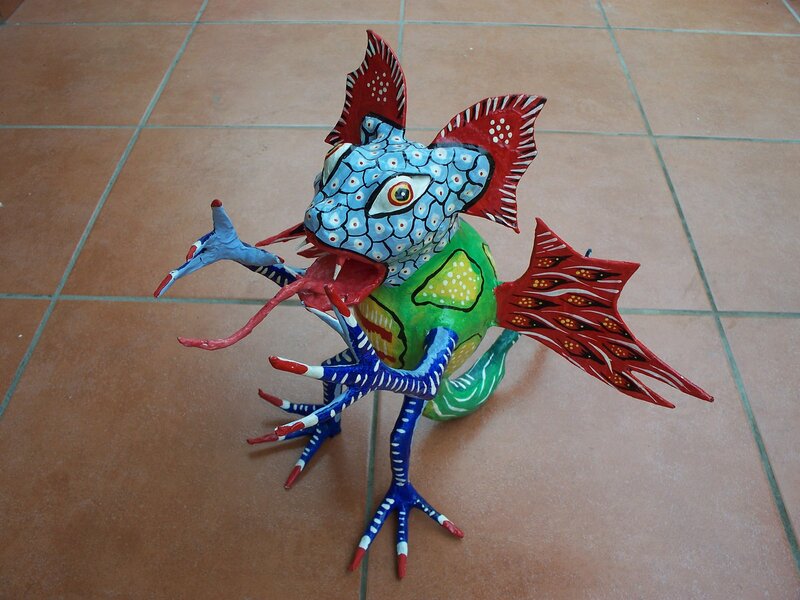 when I was smaller, I used to think that alebrijes scared my nightmares away… I really liked the one you guys got!